Types of Nails -The Ultimate Explanation! Following my previous features Types of Staples – Explainedand Brad and Pins – Explained we shall conclude with Types of Nails commonly used in this industry. Bright – the nails do not have any coating and will be susceptible to corrosion and therefore shouldn’t be used outdoors or in damp environments. Used mainly in pallet and case manufacturing where the corrosion isn’t a major concern. Electro Galvanised – the nails are covered in a coating of zinc which gives a degree of protection against the onset of the rusting process. Introducing Hot Dipped Galvanised – nails have in this process been placed in a bath of molten zinc giving a greater covering of zinc and therefore more resistance when being used in damp environments. This is not used on staples, brads or pins. Stainless Steel – the nail has in this case a full resistance to corrosion and is ideal for use outdoors. Stainless Steel is also used in woods containing tannin because the tannin will react with the ordinary Bright or Galv finish and discolour very quickly. Strip Nails – Sometimes referred to as stick nails. The nails are set at an angle and are held together most commonly with paper tape or plastic. Paper tapenails are normally set at an angle of 34 degrees and have a clipped head so the nail can neatly sit side by side in the strip. This nail is found in most 1st Fix Air Nailers and gas nailers and also the Stanley Battery BF33-2 previously featured. Plastic collationis generally set at an angle of 22 degrees and in this case has a full round head. Because of the full round head the plastic collation holds the nails apart so they can be held in a strip format. These tend to be air operated nailers and are ideally used in stock fencing(Nailing rails to posts) where the full round head can give that extra holding power. Strip Nails generally vary in thickness from 2.8 – 3.4mm and length 50mm – 100mm. Coil Nails– As it say’s on the tin the nails are wound in a coil formation and are most commonly found in air operated coil nailers. Up to the size of 50mm (2”) they are either the conical or flat type, above this size the coils are all wound in a flat collation. What I mean here (explained in the video) is the nails are wound evenly to create a flat topped coil or are wound to create a domed or conical profile towards the centre of the coil. 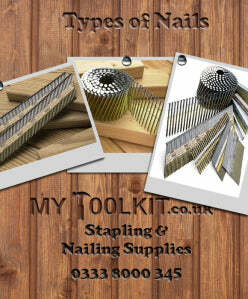 In a nutshell your nailer will take one type or the other. (excepting some new models that can adjust to take both) The reason it is critical to get the right type of coil is the wire holding the nails together is in differing positions and causes all sorts of problems and jamming!! 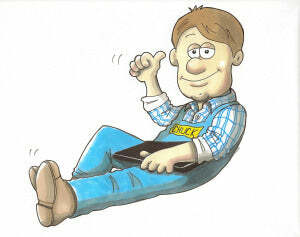 Well I’ll finish now – have a great weekend……next week we’ll be doing a tool review on the Senco Fusion nailer…..no air………no gas……..no bulls..t ………..watch this space!! !